I have some other flavor ideas I want to try with them because they are so quick and easy. I will potentially get those out in the next few weeks since they are fall flavors. I made them marbled because I love the way it looks, but I'm sure solid colors would be just as pretty too. This recipe make a little bit shy of 100 buttermints depending on how you cut them which actually isn't as many as it sounds. The bowl you see in the picture is about 5" in diameter and 4-5" deep and has around 175 in it. Bet you didn't guess that. I personally am absolutely terrible at the "guess how many is in the container" game. Terrible. Sad I know, I even try counting one layer and figuring it out from there, nope, no good. Anyway, you may run into the snafoo that I ran into while make these. I was so excited to be making them that I didn't realize I was out of sweetened condensed milk. Yeah, that's a problem. I had to make my own. Lucky for me other people have this problem too! Paula Deen helped me out in this instance though. I made a half recipe and it was a little bit more than enough for 2 batches of buttermints. I would much rather have just a little more than enough than not quite enough. It was also super quick and fit exactly what I needed, just be sure to blend the mixture enough so it's not grainy from the granulated sugar. This week 7 of the 12 Weeks of Christmas Blog Hop. The hop is hosted by Brenda at Meal Planning Magic. She's kind enough to orchestrate the whole hop and let all of us be a part of it. If you would like more information on how to join the hop check out her site and she can help you get everything you need. 1. Combine the butter and salt in the bowl of a mixer until the butter is smooth and slightly fluffy, about 1 minute. Add the powdered sugar, milk, and extract then blend until the mixture until it is completely combined, it will look crumbly. Add additional powdered sugar if needed. When the dough is squeezed by hand it should come together into a ball fairly easily. 2. At this point, if you decide you want the dough to be a stronger flavor then add more extract ⅛ teaspoon at a time. Less is always better than too much because you can always add a bit more. 3. Add the color at this time, just a few drops at a time, mixing in between until your dough reaches the desired shade. Take the dough out of the bowl and pour it onto a silpat or cutting board. Shape the dough into small balls or a log being careful not to overmix it if you want the marbled color. 4. At this point, you can either wrap the dough tightly in plastic wrap and place it in the refrigerator, or start to roll it out on a cutting board with your hands. 5. Roll a ball of dough about 1 ½” into a log that is about ½” thick, slice into ¾” bite-size pieces. The pieces should be stored in the refrigerator in an airtight container until ready to serve. These are so cute and so original! I love it! Man I can eat these like crazy! I had no clue you could even make them from scratch! I can't wait to try them. They are surprising quick and easy too! OMG! 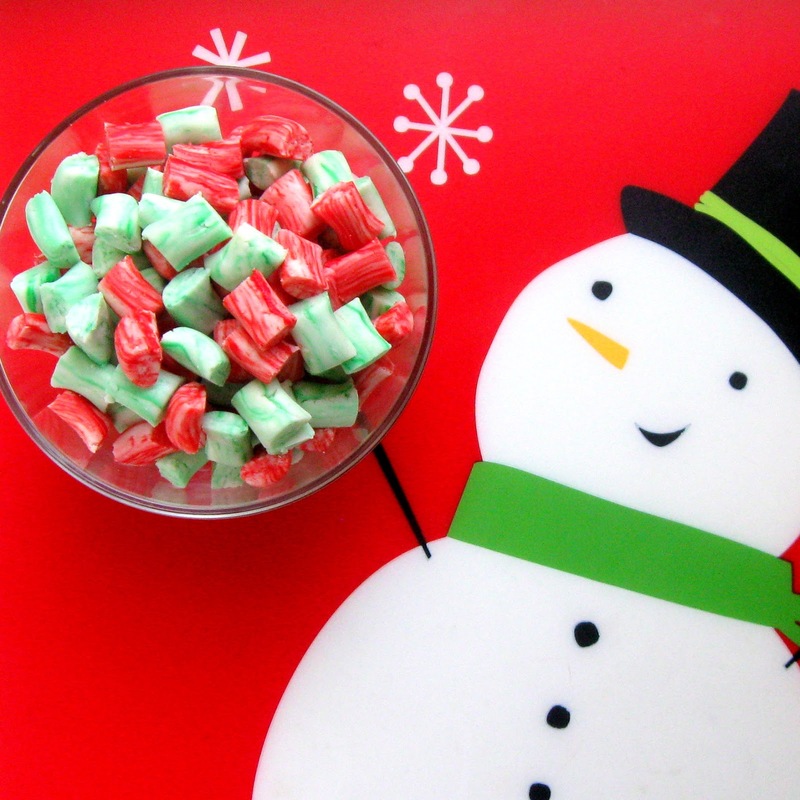 Can not wait till naptime to make these! Love it! The colors look wonderful. So Christmasy. Thanks! I really love the combination and the marbled colors. I think it adds to the festivity of the dish. Oh How Lovely! 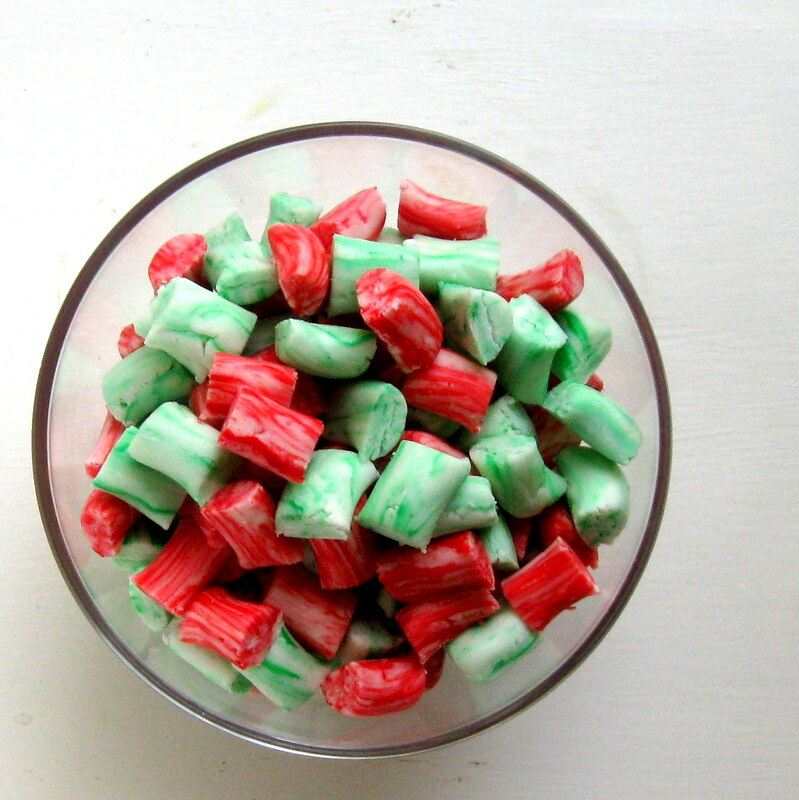 I am looking for great Christmas Candies to make this year and this has just made it to my List!! Thanks for Sharing! 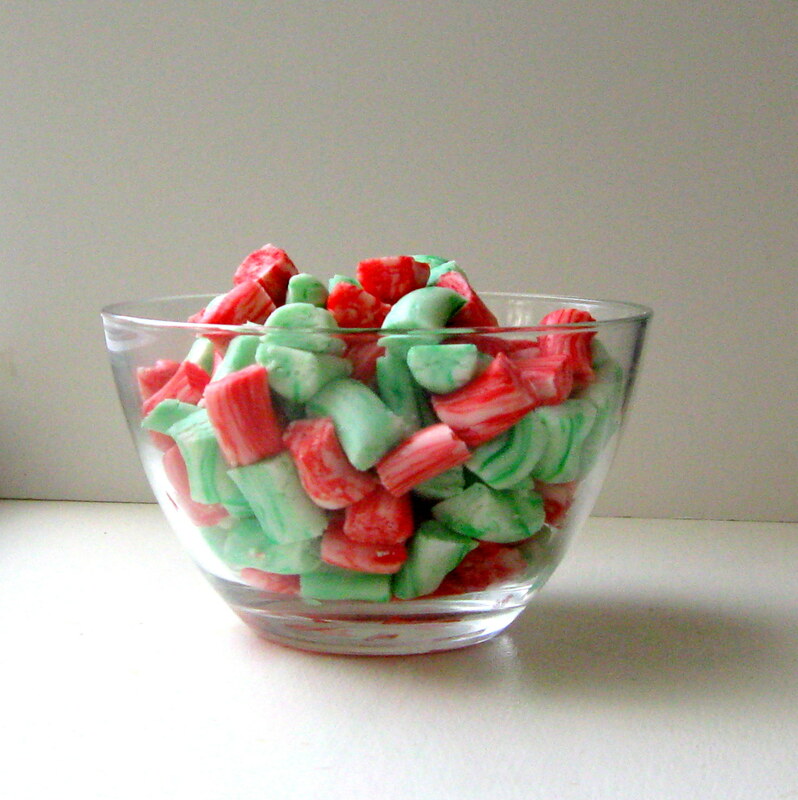 I can't believe it's so easy to make those candies. They look awesome!